People decide to buy a solar hot water heating system for a variety of reasons. In some cases, the primary consideration is to save money on water heating bills. Other people want to include environmentally friendly technologies in their home. The system switches on when the collector is hotter than the solar storage tank. Water or anti-freeze is heated as it is pumped through copper tubes in the collector. A heat exchanger transfers this heat to the storage tank. Solar heated water in the storage tank can be used immediately or later for daily hot water needs. Solar systems work automatically with existing heating equipment. 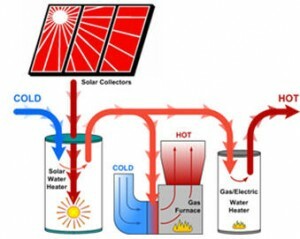 A furnace coil allows solar to provide warm air heat as well as hot water. Solar can also heat pools, hot tubs and radiant floors.